NAIROBI, Kenya, November 7, 2018 — Abortion juggernaut Marie Stopes International is being investigated in Kenya for allegedly advertising abortion on demand on two African radio stations. “This is ongoing despite the Kenya Film Classification Board placing a ban on all abortion advertisements,” wrote Daniel Yumba, chief executive officer of the country’s Medical Practitioners and Dentists Board, in a letter. “They said advertisements not only contravene the provisions of Article 26 of the Constitution of Kenya (2010) but they are also contrary to the Medical Practitioners and Dentists (Advertising) Rules, 2016,” he wrote. The country’s medical board was planning to hold an inquiry into Marie Stopes International’s alleged violation of the laws surrounding the advertising of abortion services in Kenya. Marie Stopes is alleged to have advertised abortion services on Radio Africa’s Capital FM and Classic FM stations. This inquiry comes in the wake of a campaign by pro-lifers, including an online CitizenGOAfrica petition that gathered 5,180 signatures, to get the Kenyan government to stop the abortion clinic from advertising abortion and offering its services in Kenya. “Though cunningly crafted, Marie Stopes (is) advertising abortions and (is) known for (its) abortions and every time a woman gets into their clinic pregnant and with some little cash, they leave the clinic without their pregnancy,” claims the petition. “Kenyan women and youth are now becoming a victim of the bloodthirsty clinics who are now even advertising abortions in the streets of Nairobi and other rural areas and are very angry that this is happening while it can be stopped,” it states. 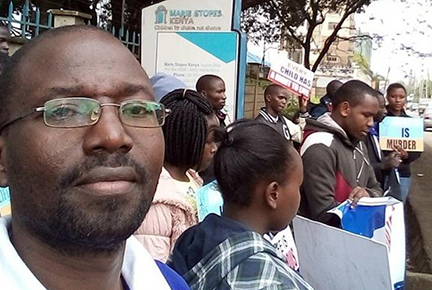 Organizers of this petition are asking their country’s equivalent of a health minister, Cabinet Secretary for Health Sicily Kariuki, to ban Marie Stopes from operating in Kenya. They also want the organization’s managers to be brought to court on charges. The board told Marie Stopes to pull the ad and issue a public apology for airing it without having submitted it for examination and classification. In Kenya, abortion is illegal except in cases were the mother’s life is deemed to be in danger. In October, pro-lifers in Kenya also sent thousands of letters to British Prime Minister Theresa May and High Commissioner to Kenya Nic Hailey, asking them to take back foreign aid money given by the British government for abortion in Kenya. Editor’s note. This appeared at LifeSiteNews and is reposted with permission.